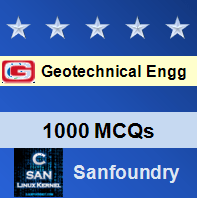 This set of Geotechnical Engineering Multiple Choice Questions & Answers (MCQs) focuses on “Load carrying capacity of piles”. Explanation: The ultimate load carrying capacity, or ultimate bearing resistance or ultimate bearing capacity Q up is defined as the maximum load which can be carried by a pile and at which the pile continues to sink without further increase of load. Explanation: The allowable load Qa is the safe load which the pile can carry safely and is determined on the basis of: i) overall stability of the pile-foundation ii) the permissible settlement iii) ultimate bearing resistance divided by factor of safety. 3. The load carrying capacity of a pile can be determined by which of the following methods? Explanation: The load carrying capacity of a pile can be determined by the following methods: i) Penetration tests ii) Dynamic formulae iii) Static formulae iv) Plate load test. 4. Which of the following are some of the commonly used dynamic formula? Explanation: The Engineers News formula as proposed by Wellington and Hiley’s formula given by the original expression of Hiley are the commonly used dynamic formula. Explanation: When a pile hammer hits the pile, the total driving energy is equal to the weight of hammer the height of drop or stroke. 6. Dynamic formulae are best suited for_________ type of soil. Explanation: Dynamic formulae are best suited to coarse grained soils for which the shear strength is independent of rate of loading. Explanation: A disadvantage of dynamic formula is that it gives no indication about the reduced bearing future settlement or temporary changes in soil structure. 8. The dynamic formula is valueless for which of the following type of soil? Explanation: For clays, the dynamic formulae are valueless because the skin friction developed in clay during driving is very much less than which occurs after a period of time. 9. In dynamic formulae what are the energy losses, that is not accounted? Explanation: In dynamic formulae, the energy loss due to vibrations, heat and damage to dolly or packaging are not taken into account. Explanation: The greater objection to any of the pile driving formulae is the uncertainty about the relationship between the dynamic and static resistance to soil. Qup = Rf + Rp.